Md. Rafiqul Islam was born at Olipur village of Matlab North Upazila under Chandpur district on 31 December 1961 to the family of the late Ansar Ali and late Masuma Khatun. He attended Olipur and Chotaholdia Primary Schools, Matlab North from 1967 to 1971. He was admitted into the Oterchar High School in January 1972 and completed his Secondary School Certificate (SSC) in 1977, in 1st Division. He entered the Bangla College of Dhaka during the session 1977-78 and completed his Higher Secondary Certificate (HSC) with a 1st Division in 1980. He graduated in B.Sc.Ag (Hons.) in 1984 from Bangladesh Agricultural University with a 2nd class degree. He continued his postgraduate studies at the same university in the Department of Agronomy and earned an MSc degree in Agronomy with 1st Class in 1986. 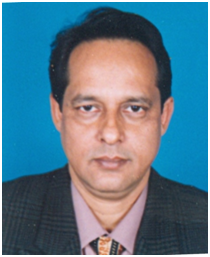 Mr. Islam joined in the Matlab Degree College, Chandpur as a Lecturer of the Department of Agriculture in June 1987 and continued his service until 19 December 1989. Consecutively, he took part in the BCS Cadre Examination of 1986 and passed, and joined at the Soil Resource Development Institute (SRDI) under Ministry of Agriculture, Govt. of Bangladesh as a Scientific Officer on 20 December 1989. He proceeded to The Netherlands for postgraduate studies in August 1994 at the International Institute for Aerospace Survey and Earth Science (ITC) presently known as Faculty of Geo-information Science and Earth Observation, the University of Twente under NFP program and earned Post-graduate degree in Soil Survey in June 1995. He started his PhD program at the Department of Agronomy of Bangabandhu Sheikh Mujibur Rahman Agricultural University in autumn 1997 which he completed in summer 2003. He utilized National Science and Technology (NST) scholarship for his PhD research. Dr. Islam left his BCS Cadre Service and took up an appointment at the Department of Agronomy, Bangabandhu Sheikh Mujibur Rahman Agricultural University, as an Assistant Professor on 16 August 2004. By dint of hard work, diligence and determination he rose rapidly through the ranks, being promoted to Associate Professor in November 2008, Professor (Grade-3) in February 2013 and Professor (Grade-2) in February 2017. He had postdoctoral research experience in Japan, at the National Institute for Agro-Environmental Sciences (NIAES) Tsukuba as a Visiting Scholar from October until December 2011.